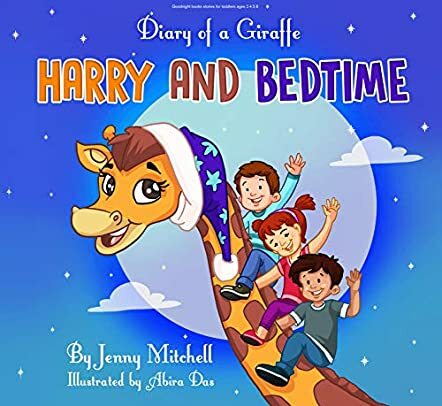 Meet Harry, the kindest giraffe in the world, in the story Diary of a Giraffe: Harry and Bedtime by Jenny Mitchell and Eugenia Mitchell. This book is very appropriately subtitled Bedtime Story Picture Book Helping your Kids Overcome Fears before Sleep. All children are Harry’s friends and he helps them to fall asleep easily and overcome nighttime fears. Harry is ready to help anyone and his long neck reaches any window. Eric, who lives on the first floor of the building, does not want to sleep and so Harry lulls him to sleep by making Eric sit on his long neck. Emily, who is on the third floor, is scared of the dark so Harry gives her his magic night light and the little girl falls asleep. He also helps Mark, Peter, Kate, Leo, and little Lily to fall asleep. This delightful story is about helping children overcome their fears before sleeping and about kindness. Harry’s kindness is tangible to young readers throughout the story. The beautiful illustrations are lively and colorful and they bring Harry and the rest of the characters to life. The pictures also breathe energy into the scenes, giving them fluidity and movement. Books with messages, concepts, and morals are always good for children, such as this story, because youngsters understand concepts and messages easily when these are knitted into a story. What a perfect picture book for bedtime storytelling! Parents and grandparents will enjoy reading it aloud while putting their young children and grandchildren to bed. Since the theme is relevant, it is a good storybook for interactive sessions in classrooms and school libraries because of the message it conveys. An adorable read!